What do you believe my friends? Our beliefs begin in childhood, nestling into our psyche right from the start. Don’t believe me? Have you ever heard your mother’s words coming out of your mouth for example? Do you find yourself doing X (whatever example you want to use) just the way you were taught as a child, even when you know there’s an easier or better way? But you can’t help yourself, and you continue to do it that way because that’s how it’s always been done? Do you have limited beliefs in yourself because you were told that you weren’t smart enough or that you wouldn’t amount to anything? Or perhaps you were told you could do anything, and you have? Parenting before the age of 7 is paramount to a child’s self-esteem and belief system about everything, including themselves. We may not even remember what we were told, but we know in your minds that it is true. Even when it’s proven not to be true. Why? Because the adults in our lives told us so when we were children. So the next time you are parenting, think before you speak or give yourself a time out in order to center your thoughts. 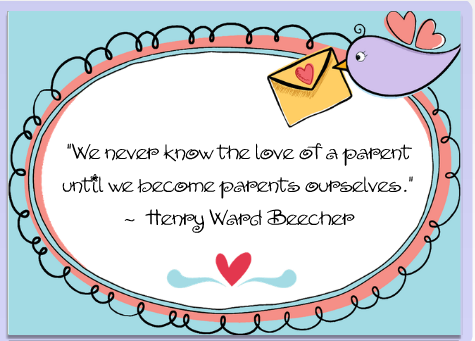 Your children are listening with minds of sponges and beliefs that you are creating for them for a lifetime. School has begun here now for a few weeks and everyone is starting to settle in to the new routines of getting up early, having homework and we are happily back into sports. I always look forward to September as for me, it’s a new beginning. There’s nothing like crisp fall days that invigorate mind, body and soul. At least for me ~ how do you feel about the seasons? Do you have a favorite? Could it be Fall? I am happy to say that both of my parents were alive when I had children and as mine have grown, I have been able to appreciate many aspects of my parents that I had not been able to understand while I was growing up. Perhaps it is a blessing to learn this while I am still a parent and I still have one living. Parenting isn’t an easy job, but it is a fulfilling one and one that encompasses our entire lives. I am a Mom first and foremost and it has been the happiest ‘job’ I’ve ever known. Sure, it is not a 9-5pm job (but then most are not anyway), but it has given me such great joy and wonder and gratitude to parent my children. What blessings they are in my life! They bring such love, enthusiasm and learning to me and I hope and pray they feel the same way. I loved the quote above, so as always, I had to share it with you. I hope that as you go about your day today, you are inspired to find gratitude and love when you think about your own parents and your own children (if you have any). Life is not always easy, but we have the choice to look at the good and raise our faces to the sunshine. Hug your children and your parents when you can. Life is short and we only have this precious day to enjoy! May you have the most beautiful day today and always.